The wooden Multi Shelf by ferm living keeps the chaos of everyday life at bay and provides order in the kitchen, hallway, bedroom and office. 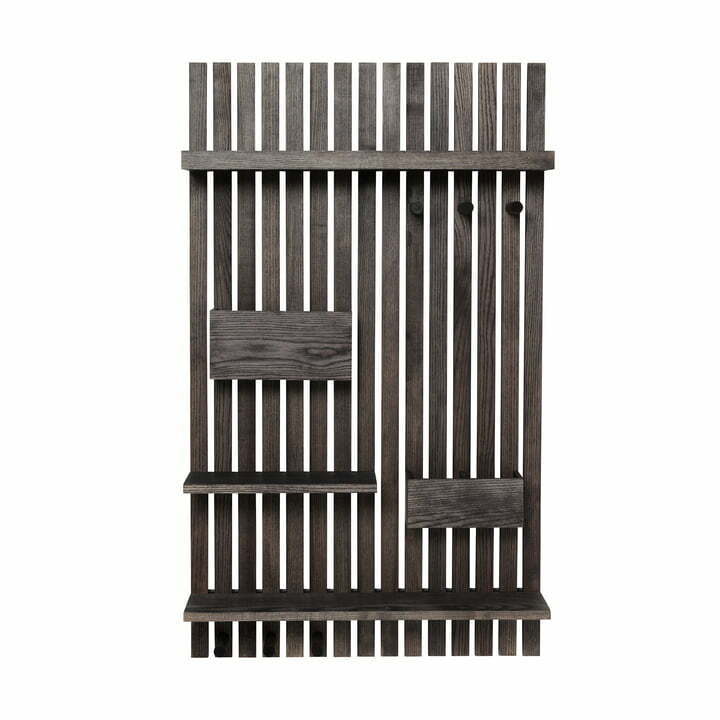 Made of black stained ash wood, the wall shelf has a natural appearance that is reminiscent of a industrial pallet and fits seamlessly into various interior styles, especially modern facilities. Thanks to the practical shelves and hooks, personal belonging are easily and decoratively organised. In the hallway, the Multi Shelf is perfect for scarves, jackets, shopping lists and keys. In the kitchen however, the shelves can serve to arrange the spices and kitchen utensils in a neat way while the hooks are perfect to hang up tea towels. 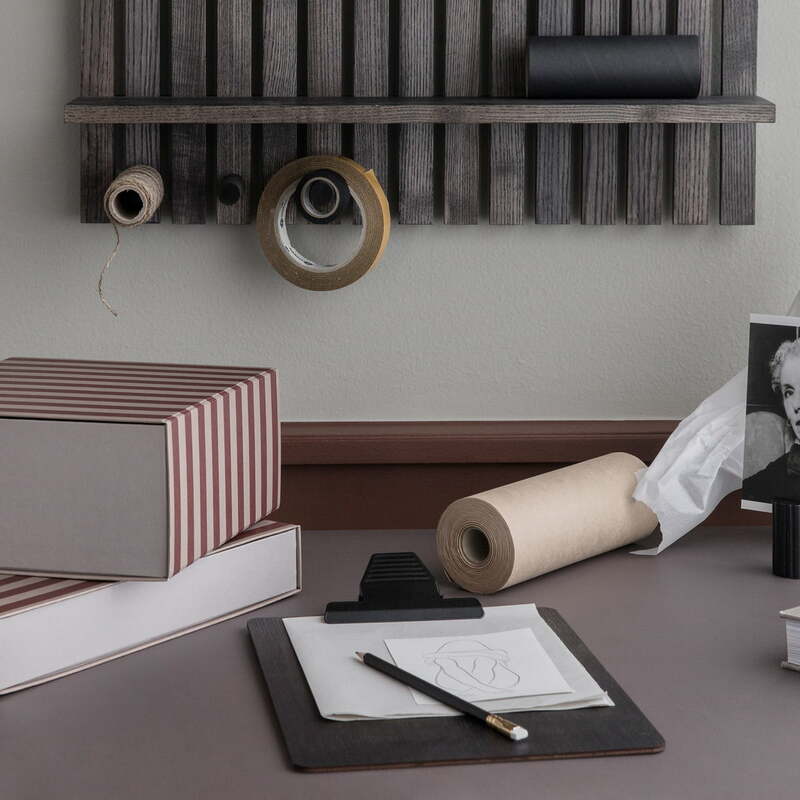 The wooden shelf is also perfect to keep the workplace tidy and to make everyday life that little bit easier. Isolated product image of the wooden Multi Shelf by ferm Living in black stained ash. 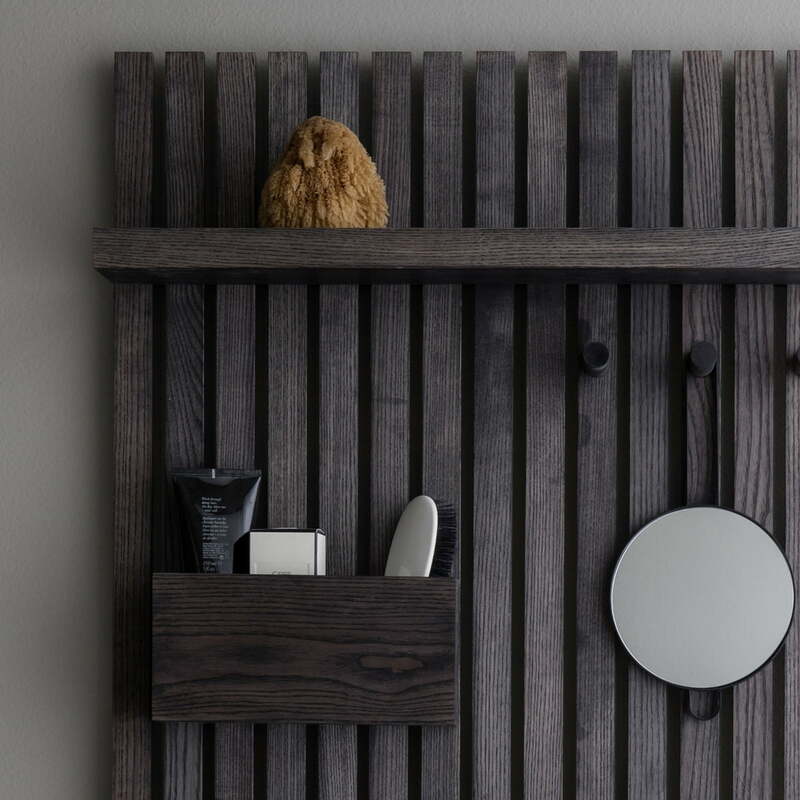 The simple and discreet wall shelf is made of black stained ash. Wooden Multi Shelf by ferm Living: The wooden multi shelf by ferm living keeps the daily chaos at bay and provides order in the kitchen, hallway, bedroom and office. 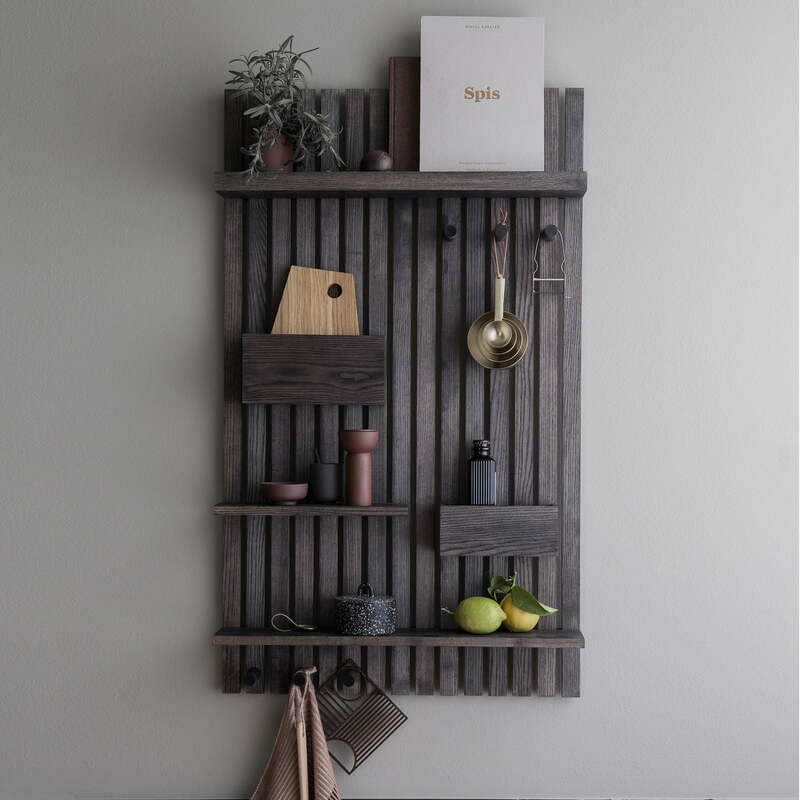 Lifetyle product image of the wooden Multi Shelf by ferm Living: Thanks to the practical shelves and hooks, personal belonging are easily and decoratively organised. 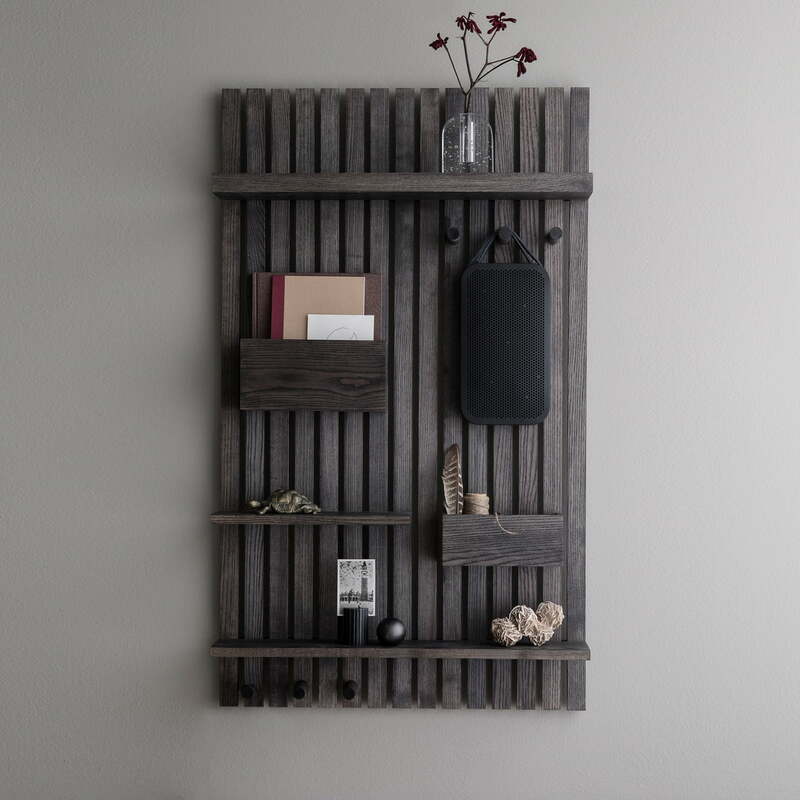 Made of black stained ash wood, the wall shelf has a natural appearance that is reminiscent of a industrial pallet and fits seamlessly into various interior styles, especially modern facilities. In the hallway, the Multi Shelf is perfect for scarves, jackets, shopping lists and keys. In the kitchen however, the shelves can serve to arrange the spices and kitchen utensils in a neat way while the hooks are perfect to hang up tea towels. Wooden Multi Shelf by ferm Living: The wooden multi shelf is perfect to keep the workplace organised and to make everyday life that little bit easier.